With five and a half months of text messages suddenly gone-a-missin' between Peter Strzok and Lisa Page, the FBI is letting their corruption show. The Fix was in during the election, and now post-election to destroy a sitting President, The Fix is in even deeper. We know it, they know it, and they know we know it. Stand Strong America and keep the pressure on, because the lying socialist mainstream media in this nation are complicit in the sedition and sabotage of our Republic. -W.E. 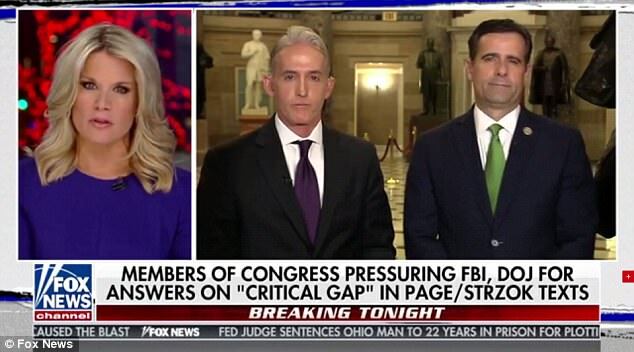 Rep. John Ratcliffe and Rep. Trey Gowdy spoke with Fox News on Monday after the news broke about the 50,000 new text messages.